The Lynx Tank is the cats whiskers of an atomiser. It is a top filling tank that holds 2ml of e-liquid. Running at 22mm wide, the Lynx can fit on any of our high powered batteries and look completely at home. Constructed out of resin and stainless steel, this tank is TOUGH and the qualities of the resin make each tank completely unique. With two different sub-ohm coil options for the Lynx Tank, 0.25Ω (pre-installed) & 0.5Ω, both coil options are dual vertical coils (DVC) so you know you’re getting the best vapor production and flavour no matter which resistance you choose. 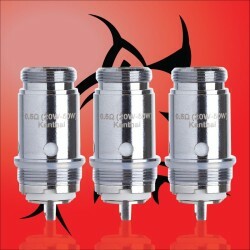 The 0.5Ω coils can run up to 50W and the 0.25Ω coils run up to 55W, making them usable on any high powered batteries. Blasting a 10mm dual adjustable airflow and the included 10mm bore resin drip tip, the airflow won't be restricted, so you can vape away with easy pulls from this tank! For a leak-free vaping experience, the glass is held on by an extra-large o-ring at the base. Plus, just in case your Lynx Tank takes a fall, an extra piece of glass is included so your new favourite tank doesn’t come to an untimely end. This tank is a great addition to your range. Thought I would give this tank a try and I have to say not disappointed. It produces a nice amount of vapour and the taste of the liquid (blackjack in my case) is fantastic. Very happy I tried this tank. The best atomiser I have used to date! I have always used the atom atomiser until the Lynx arrived in store. I was apprehensive to try a new atomiser at first as i was very happy with my atom tank, but this was recommended to me so I thought I would give it a try.<br /> I love the fact that it is a top fill unit, I don't have to take it apart to fill it and saves any messy filling.<br /> The vape is amazing, really smooth without any harshness. I use the Innevape Heisenberg menthol and the flavour is immense with this atomiser. One very happy customer! !